The new mystery GM prototype has been caught wearing Swedish registration plates. 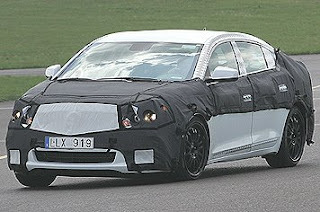 This car resembles the new Holden which GM is working on. We can see this by the shape of the grille and the large circular badge visible under the front disguise. According to the database for the license plate number, this car is 485cm long, 180cm wide and weighs 1650kg. It should have a 260bhp engine, which is most likely a V6 with an automatic gearbox. If it is of course a Holden, it could have a four-wheel drive transmission or a turbocharged engine. It will be running off the new Epsilon 2 platform. Nothing else about this car is even known. So prices are out of the question and so is auto insurance quotes.